Construction is two months ahead of schedule on the $1.4-billion Calgary Cancer Centre, which will add 1,500 jobs to the Calgary economy over the next six years. 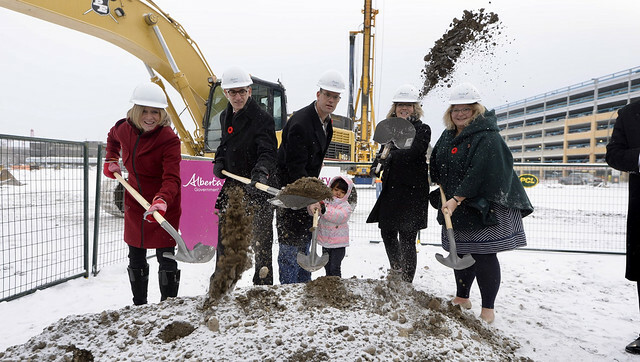 L-R: Premier Notley, Dr. Francois Belanger, Will Morlidge with daughter Virginia, Minister Jansen and Minister Hoffman break ground on the Calgary Cancer Centre. When it opens in 2023, the Calgary Cancer Centre will offer comprehensive care, cancer research and education in a single state-of-the-art facility. “My wife Rebecca's legacy lives on in what she wanted the new Calgary Cancer Centre to be: a place of openness and a healing environment where patients will be given every chance possible to overcome their illness, and a place that radiates hope." PCL Construction Management Inc. was selected to design and build the Calgary Cancer Centre, which will be located on the Foothills Medical Centre site with an elevated walkway connecting the new facility with existing buildings. Due to construction, the west lane and sidewalk on 29 Street will be closed, with pedestrian traffic diverted to the east side of the street. Excavation, shoring and piling activity will begin in November and run to spring 2018.